Shelter: Shorewood Cocker Rescue, Inc.
Hershey Kiss is a 2 – 3 year old chocolate and white cocker spaniel. She lives up to her name; when you sit down, she comes up to smother you with kisses! 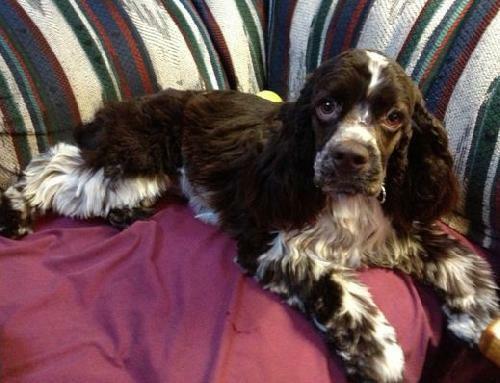 Hershey is a friendly, happy, lively, interested, and adorable pup, who came to the rescue from Houston, Texas. She adapted to our home and our other dogs very quickly. Hershey loves to run in the yard, and sit on your lap. She is house trained, though she is a submissive wetter, so if you get too excited to see her, she will pee. If you let her get used to the situation before you greet her, she is fine. Hershey is also crate trained. Hershey entertains herself with stuffed animals, though has trouble distinguishing her toys from the sheets on the couch, socks on the floor, leashes, etc.! She does learn quickly though, and will stop any behavior when told to stop. She walks well on a leash and plays well with cats. Hershey Kiss would make a wonderful family pet. We do not encourage adoptions to families with young children. We are very concerned about the well being of your children as well as that of our dogs. We realize that each case is different and our adopting dogs to families with children 10 years of age or older will be based not only on the children’s age but their exposure and experience with the Cocker Spaniel and other dog breeds. Sorry but we will not place a dog in a family with a child under 10 years of age, unless there is already a dog living in that home. 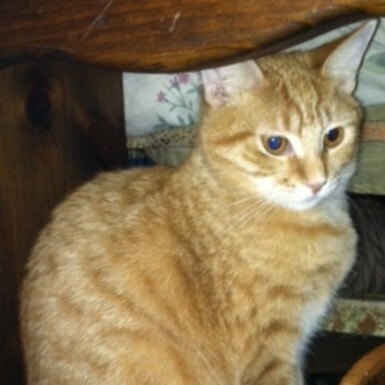 Pumpkin is a eleven month old (as of July) orange tabby who is so, so sweet and also very playful.. He is a bit shy, but has no problem being held and loved.. His dream is to get a home with lots of toys so he could play all day.., along with unconditional love from his family! If you would like to find out more about Pumpkin.. please contact his friend, Judy, at 954-802-0547 or email catchic415@aol.com. This listing is provided as a courtesy to someone currently caring for a pet who can no longer do so and wishes to place the pet directly. The information has been provided by the lister and not verified by Animal Aid. Those services normally provided by Animal Aid do not apply to this pet. Mollie recently posted..COMPETITON..WIN A BANDANNA…. Oh these two just melt my heart! They are both adorable and I sure hope they find loving forever homes! Bassetmomma recently posted..Wordless Wednesday – Can You Spot All Seven Hounds? Such sweet faces. Hoping they get their forever homes soon soon. Oh such sweet little pets. We really hope they find a good home. We are purring they find a loving home soon! What sweet hearts they both are. We grew up with a cocker spaniel, so they are close to our hearts, as are all kitties. Oui Oui recently posted..Happy Thanksgiving! (From the human mom): I have an orange tabby and I can honestly say that I’ve been so blessed with him (as well as my Siamese kitty) in my life! Cats are truly precious creatures 🙂 Pumpkin looks very sweet. I will pray he finds a very good, loving home soon. All fur babies deserve to have unconditional love and a great home to call their own. Please keep us posted, ok?